Sausage & Potato Soup with Spinach & Bacon could be the cousin of Olive Garden’s Zuppa Toscana. That however, was not at all my motivation for making this new recipe. Did I tell you the story of how we scored 30+ pounds of bacon and sausage?? Can you imagine the delight when this text message hit my phone. We’re food bloggers. We never turn down free food. And we certainly don’t turn down bacon and sausage. The next day this cooler showed up outside my door. We shoved and crammed every last package into our freezer and one pound at a time we’ve been working through this gold mine. Check out our Chili Gumbo that I made for Mardi Gras. 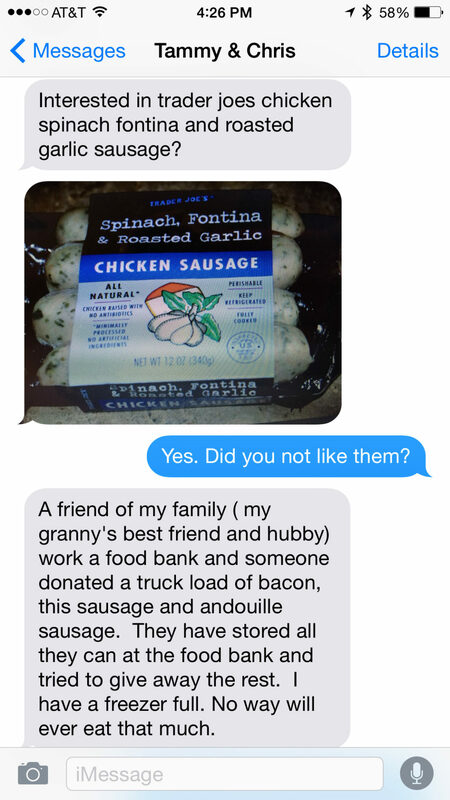 That used three packages of the Chicken Andouille. It was delicious!! If you like Olive Garden's Zuppa Tuscana you'll love this variation. In a Dutch oven or heavy bottom pot, cook bacon until crispy. Remove to drain and pour off drippings. Add sausage links with a ½-inch of water (Our sausage were precooked, adjust cooking time as needed); cook over medium heat until water evaporates and they are heated through. Slice and reserve. Add potatoes and onion to the pan and sauté for about 5 minutes until onions begin to soften. Add minced garlic, basil, oregano and chicken broth. Simmer until potatoes are just fork tender. Stir in sausage and cream, season with salt & pepper to taste and heat through. Serve topped with crispy bacon. Holy moly! What a windfall! And these are some of my very favorite flavors–I love sausage probably more than I should! You have created a truly beautiful soup with these wonderful ingredients! I hope you’re staying warm out there! We’ve run off the snow Tracey. But we’re still in soup mode. Thank you for stopping by. Wow! Kind of reminds me of the time I lived near a super discount grocery store, and they would have extreme discounts on name brand stuff all the time. It was always a huge score when they had Trader Joe’s stuff! I love your little soup pot too, too cute! Welcome Ashley. We’re feeling oh so lucky with this score. Thanks for stopping by. You are so lucky to score all that yumminess!! This soup looks and sounds so warm and inviting! YUM! Blessed with Bacon Becky. That’s us ;) It’s been fun coming up with ways to incorporate all this goodness. Perfect winter soup, I could eat this all seaon long!! Thanks Tara. The really nice thing about this soup is the chicken sausage are very low in fat and calories but big on flavor. No guilt here!! Can’t beat this combo for a cold wintry day. YUM. You bet KC!! Soups rock. Now this is some serious comfort food, yum! This soup sounds really delicious! I love how quick and easy it is too! Thanks Nicole. The precooked chicken sausage were delicious and made for easy cooking. This is a such an awesome recipe. I love the pics too. The soup looks very inviting. I appreciate you Rini. Thank you for stopping by.